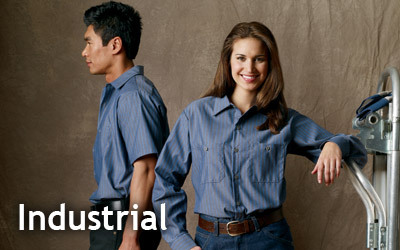 At Paramount Linen, we offer Industrial and Casual Uniforms. Please click below to learn more. As a part of Paramount's service guarantee, each of your employees will be fitted by a Paramount representative. This will ensure that all of your employees attain the comfort and look they desire from the very first time they put on a Paramount uniform. Each uniform will be personalized with your specific employees' names and corresponding bar codes. Your uniforms are then tracked on a weekly basis through Paramount's computer system to guarantee that your uniforms are being cleaned and returned to you. At Paramount we understand how crucial it is to have your uniforms reflect a continued standard of quality and performance. For this reason, Paramount offers free repairs and free replacement on an "as needed" basis. Our quality control staff examines each uniform as they come into the plant. This enables us to personally guarantee that your employees maintain a professional appearance all year round. Paramount is an exclusive distributor of Red Kap, known for their tradition of excellence when it comes to providing the highest quality products. This working relationship allows you the customer to receive the best products at the best price. At Paramount we understand the cost that it requires to run a business or company. For this reason, Paramount's service does not contain any miscellaneous service charges, uniform inventory charges, or frequent pricing increases. Our goal is simple; we want to provide you with a product you can count on, at a price you can count on.